Corners Tavern recently opened in downtown Walnut Creek in March and will begin serving lunch with an all new lunch menu as well as offer outdoor dining on May 1st. Lunch will be available from 11:30am – 2pm, with a mid-day menu available afterwards until dinner. Check out the lunch menu here. I can’t wait to try the barbecue pork sandwich, pickled peppers, grilled peach salad as well as the Corners burger and house made sausage. Corners Tavern will begin serving lunch on Tuesday, May 1. Open Monday – Friday from 11:30am – 2pm, the menu will feature the same big, bold flavors found on the dinner menu. New lunch favorites will include charred yellowtail fish tacos with green cabbage and avocado cucumber salad; a barbecue pork sandwich with pickled peppers and grilled peach salad; andgrilled skirt steak with spicy butter, grilled green onions and fries. Corners Tavern will remain open after lunch service with a mid-day menu featuring a limited number of items including salads, the newly added smoked chicken wings, house-made charcuterie, the Corners burger and a variety of light snacks such as the smoked and spiced almonds and duck fat roasted potatoes. The mid-day menu will be a perfect respite for Walnut Creek shoppers looking for a small bite between meals accompanied by a nice, cold beverage. In addition to the new hours, Corners Tavern will open up the outdoor patio for additional seating and (weather permitting) will have the large garage doors at the front of the restaurant open, creating an open-air vibe. 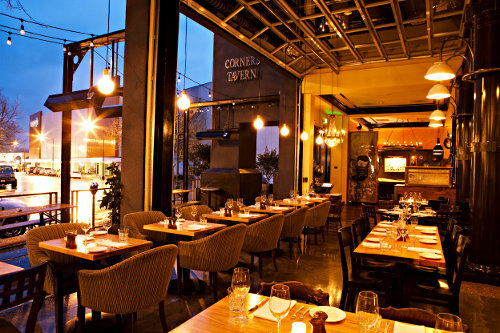 Corners Tavern is located at 1342 Broadway Plaza next to Macy’s and La Boulange Bakery in downtown Walnut Creek. Anyone check this place out yet? You can see the dinner menu here. For the fans, any must order items?